TFA designed this facility to house the administrative offices, design studios and warehouse for a local rug company. 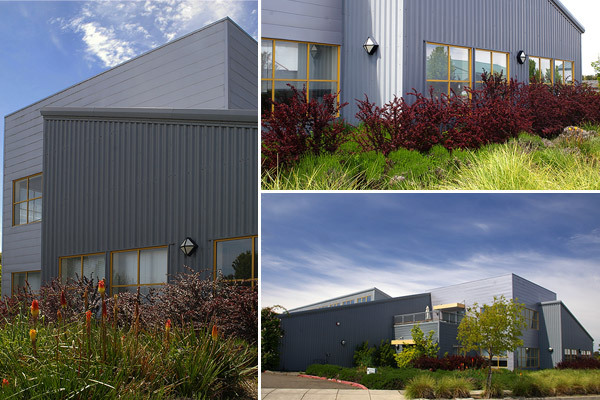 With an industrial design aesthetic that allows the use of economical structural steel framing and steel wall and roof panels, this building also met the client’s desire for a facility with a modern image. The building is a composition of cubes, rectangular and angled forms that create deep shadow lines, with a roof deck for the staff and naturally lighted high loft spaces that serve the warehouse and design studio areas. The exterior forms are clad in metal siding that alternately consists of either vertical or horizontal ribbing or flat horizontal panels. Bright yellow window frames and nautically inspired light fixtures complete the exterior design. The interior design continues this industrial motif with exposed steel beams and steel stairs with cable railings.